Simple. Elegant. Luxurious. 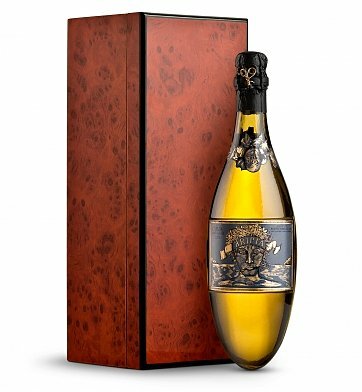 A bottle of the prestigious Kripta Brut Nature Cava Gran Reserva will arrive in a stunning lacquered burlwood box handmade to the highest standards of craftsmanship. Spectacular inside and out, the Kripta has been called one of the best cavas in Spain and in the world. Once the wine has been enjoyed the stunning burlwood box makes a tasteful decorative accent to the home or office, and a memorable way to present a bottle of one of the world's most celebrated cavas. Kripta in Handcrafted Burgundy Burlwood Box is a hand delivered gift. These gifts are delivered by one of our local design centers located throughout the United States and Canada. Same day delivery is available for most gifts when ordered before the cutoff time. The cutoff time for Kripta in Handcrafted Burgundy Burlwood Box is 1 PM in the recipient's time zone. Kripta Brut Nature Cava Gran ReservaButtery and velvety with notes of walnuts and a wonderfully long finish. One of the world's finest Spanish Cavas. A laquered burlwood presentation box. This piece presents very well and feels like a quality gift. The wood box was enclosed in a velvet-like black pouch with a drawstring, and within that had a black satin ribbon tied around the box itself - very sophisticated. The box is incredibly beautiful, with the bottom and inside layered with a soft black fabric to cushion the contents and the edge against any surface. The bottle is encased in bubble wrap within the box and doesn't come with a stand, so once they open it they need to empty it immediately or create a makeshift stand to last them the evening.The box arrived with a lot of bubble wrap inside the box as well as surrounding the bottle. As a gift, it's great, but someone on the receiving end has a lot of bubble wrap to get through, which takes away from the gift opening experience. You know your bottle will be safe though. Luckily I am going to hand deliver this, so I am removing a lot of the bubble wrap as it kills the presentation. Would recommend. Delivered as promised and impressed the recipient very much. I wish I ordered one for me! They loved it. I think it's going to have a lasting impression. Just what we hoped for!!!! !